Saturday, September 8, 2018 @ 6 p.m.
Live-action, shadow puppetry, film, animation, music that seems to be now live, now recorded, images of nature on which the eye gorges, representations of good and evil, romance and tragedy, associated with storytelling on rapidly transforming scales—now epic, now lyric, now comic: "Feathers of Fire" has high theatrical ambitions indeed. 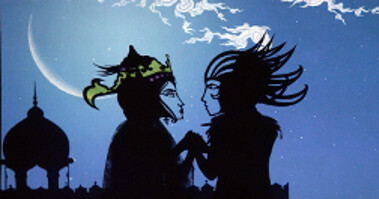 It combines moving pictures and the stage in ninety minutes of spectacle that seems to call on story elements from every entry in Stith Thompson's folktale motif index and that recalls the 1926 shadow-puppet animation of Lotte Reiniger, The Adventures of Prince Achmed (based on Andrew Lang's retelling of a story from One Thousand and One Nights), with which Rahmanian became enamored to the point of obsession and then surpassed. Zaul and Rudabeh. Photo by Fictionville Studio. In "Feathers of Fire", there's a hero born with white hair, spikily styled like one of David Bowie's personalities, whose mother dies in his birth and who, when his father takes him to the wilderness to expose him, is adopted by a gigantic, magical bird who rears him in her nest with her chicks. He enjoys a love story with a beautiful princess (given a shadow-puppet profile that is so specific it seems to be a portrait) and reconciliation with his father. To save a kingdom he enjoins the assistance of a sea monster and a huge lion, entirely through rational argument. And there is much else. By the end of the ninety minutes, we have been brought to the point of the global story where the "King's Book of Kings"—the tenth-century Shahnameh, a 60,000-verse epic by the Persian poet Ferdowsi—actually begins. The only flaw, for this audience member, was literary and verbal: the script (which had some wild discrepancies of tone, from Hollywood Biblical to Bronxtalk) and the awkward line readings (although it is a challenge to invent a persuasive tone of voice for a sea monster, not to speak of one's beloved, without making the individual sound silly while having to explain plot points, such as "I'm going to kill a duck."). Hamid Rahmanian with puppet. Photo by Fictionville Studio. 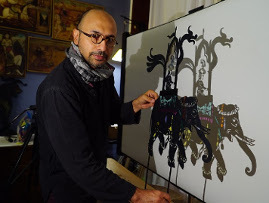 Hamid Rahmanian, the native of Tehran and internationally admired and much-awarded artist who fathered this show, has an essay in a booklet entitled "The Art & Story of Feathers of Fire," in which he explains that, since 2008, he has dedicated himself to "introducing the stories and art of Shahnameh to the West and creating a new visual culture based on [his] passion and love for the many traditional visual art forms of Iran prior to the twentieth century." In 2013, Rahmanian "created and illustrated a 600-page edition of Ferdowski's poem with a new translation and adaptation by Ahmad Sadri." The booklet with Rahmanian's essay, a bargain ($20) publication filled with storyboards and examples of how the puppets and backgrounds were developed, was available for sale at intermission. So was his boxed edition of the Shahnameh, which is very beautiful bookmaking—as well as expensive ($85). Also on sale was a new pop-up book ($45), "The Legend of the Serpent King Zahhak", based on a different story from the Shahnameh—with almost incredible examples of paper engineering (and some surprising placements offeathers). You haven't seen a living Hell until you've seen, in pop-up, a figure who bears a coincidental resemblance (surely!) to the Ayatollah Khomeini, strung up in the deepest cave of a mountain with golden chains encircling his armpits to "the end of his days." This conclusion provides, for this unromantic and enraged story, a certain righteous satisfaction at the justice meted out. One of the creators of "Feathers of Fire" announced from the stage that the several performances in September at the Kaye were going to be the last shows of this program for a while. (In 2016, the production was presented at BAM and The Metropolitan Museum of Art.) Since to put it on requires actors, puppeteers, film technicians, musicians, and stagehands, one is surprised to discover that it took Rahmanian and his team only two years to create the 156 puppets, the 138 animated backgrounds, and the fifteen masks and costumes for live actors the show calls for. I also wondered about the possible connection between Rahmanian's efforts to present Iran's literary and artistic heritage to Americans during the two terms of Barak Obama's Presidency, which resulted in, among other things, the Iran Nuclear Agreement, in 2015, and the coincidental closing of performances with the United States's abandonment of the agreement under the Trump Administration.